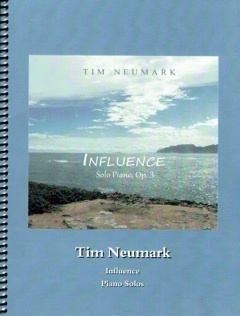 Influence is the companion songbook to Tim Neumark’s 2009 CD by the same name and the remastered version released in 2014. (The songbook is based on the remastered version.) All twelve pieces are included, transcribed by John Zechiel and proofed and edited by Tim and myself. 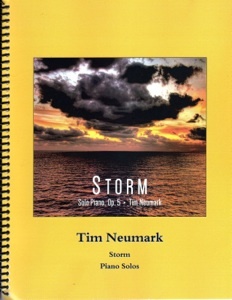 Tim is very hands-on about his sheet music and wants the transcriptions to be as close to the recordings as possible with very specific playing instructions and dynamics. (Not all composers do this.) This book is a lot of fun to play and the pieces are not difficult. Since the music was inspired by various people and places that have affected Tim’s life in one way or another, there is a very pleasing variety of moods and playing styles included. Some pieces are slow and relaxed and range up to the fast and playful “Thurman,” which was inspired by a very happy dog (in my CD review, I called this piece “laughter set to music.”). 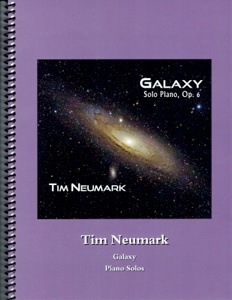 Pianists from an intermediate level on up should find plenty to enjoy in this book. The book itself is spiral bound with beautiful full-color photos on the front and back covers. The music is well-spaced and easy to read, printed on a somewhat heavier bright white paper stock. As I mentioned, the dynamics and playing instructions are specific and include metronome settings and pedaling suggestions. Piano teachers should also take a look at this music for some of their advancing students. 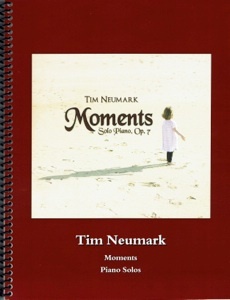 The book is available in hard copy or download (PDF) from TimNeumark.com. Recommended!